Five years ago, the Go-Gos parted ways with long-time bassist Kathy Valentine. In August 2006, the played the final show of their farewell tour at the Hollywood Bowl. Both of those events reversed direction on Monday (January 29) night at the Bowery Ballroom in New York when the five members of the classic lineup of the Go-Gos, Belinda Carlisle, Jane Weidlin, Charlotte Caffey, Gina Schock and Valentine, took the stage for a 17-song set to celebrate the upcoming Broadway show Head Over Heals, based on the band's songs. According to Vogue, the entire venue was decked out with the show's logo along with other props and memorabilia related to the band and the musical. The band also included the cast from the show who they invited up on stage to perform with them. 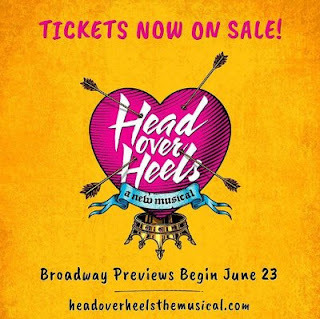 Head Over Heels will preview at the Curran Theatre in San Francisco from April 10 to May 6 before the start of Broadway previews on June 23 followed by a July 26 opening night. The show will play at the Hudson Theatre, which opened in 1903 and is newly refurbished after decades of use as a television studio, disco and movie theater. According to press material for the show, it is "An inspired mash-up of posh and punk [...] an unpredictable Elizabethan romp about a royal family that must prevent an oracle’s prophecy of doom. In order to save their beloved kingdom, the family embarks on an extravagant journey where they are faced with mistaken identities, love triangles, sexual awakening and self-discovery."